If sourcing a story is like casting a movie, experts are like celebrities. They can impart gravity and credibility and eloquence that the facts can’t on their own. They can boost ticket sales. But finding the right expert is easier said than done. Subject-matter experts, like celebrities, don’t pick up the phone for everyone. But good reporters know when and how to work the phones and email to put top sources in their stories. How do they do it? To find out, we recruited reporter Bob Van Voris, a legal reporter for Bloomberg News. 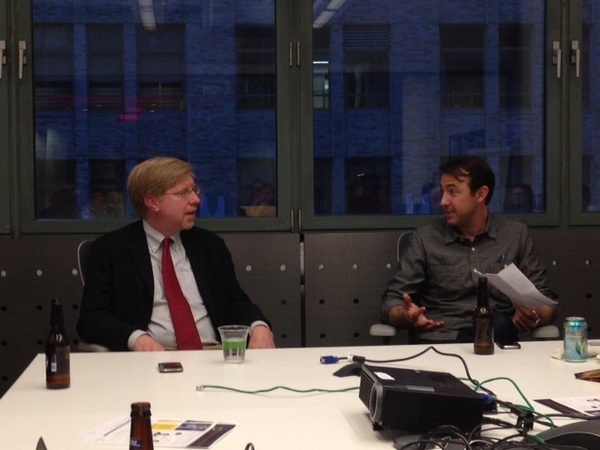 Van Voris, a former practicing attorney, was the featured speaker at a freelancer meetup we co-hosted with Contently. He shared his advice on and experience with finding sources, vetting their expertise, identifying the ones who will give you great quotes, and more. It was a great event, and Van Voris was generous with his time and experience. Here is a recap of some of his insight and advice. A tip of the hat to Contently’s John Hazard, who did a great job moderating the discussion. What was the source that was farthest afield from what you were covering? What I was at the National Law Journal, I was covering a story about a lawyer in California who developed a practice specializing on litigation involving penile augmentation gone wrong. My editor suggested I contact a mohel. So I did, and I awkwardly asked him what happens when there’s a mistake. Needless to say, he really didn’t want to talk about it. I went back and convinced my editor that the story didn’t really need a mohel. But when you’re writing about something that’s complicated and you need to explain it to readers, you don’t want it to sound like a seminar. If it’s dry, you need people who can make it understandable. You need to give readers something a little fun, a little compelling. How do you identify someone who will give you a great quote? It’s definitely trial and error. First, start with a pool of people to choose from. You can find them through ProfNet, or on the lists of people who attend conferences on the topic. Talk to a few of them and see who is good at expressing the point in a way that will appeal to readers. You have to put in the time and talk to people. Of course, sometimes you don’t have that luxury and you have to talk to a specific person. If you aren’t getting what you need, don’t be afraid to bring them to the same point two or three times. Ask them, “How would I tell this to my mom?” to get them to simplify. Sometimes, by the second or third time through, they’ll be a lot looser and will give you a better quote. There will be conversations that will go nowhere, but those can still be useful because you can learn about the topic, especially if it’s something you’re not too familiar with. What about using other reporters, like at niche publications, as sources? Members of the local press are good sources for background; trade magazine reporters are, too. They know the gossip, and they like to talk about what they know. They like to talk. How do deadlines affect this “audition” process? I would imagine you have very tight deadlines at Bloomberg. to be a good tool. I’ll put out a query in the morning, and when I’m ready to start in the afternoon, I have several emails waiting. What do you do when you hit the source “wall” and you don’t know whom to contact? I recently had to get sources quickly for a story covering a gay-marriage case in the Second Circuit. It’s not ideal, but I’ll look at who has been quoted in the Times that I can contact quickly. How do you then make sure you get something unique? You try to get them off their talking points. Anyone on a wire deadline will have two or three go-to people. You’re not going to have a really deep interview with them. The interview will be two minutes long, and you’ll get a good quote, but those people tend to get over-represented. That is a really good reason to go on ProfNet, go on Google, call two or three new people — so you’re not getting the same people. On a short deadline, the important thing is getting your call answered or getting a call back in two minutes. The source who is new to you today might be a regular source down the road. How do you vet the experts who’ve responded to your query? If I’m on deadline, it’s pretty ruthless. If I get 20 emails, I can kind of sort through them just by their responses. You don’t want people who have been in every newspaper or program. You can check their education, what kind of committees they’re on, their résumé, if they’ve written about the topic. You can’t spend hours on it, but you need to do it. Sometimes I do it while I’m on the phone with the source. My biggest fear is, I don’t want to be played; I don’t want to look like an idiot. Anytime you have a new source, you need to question them about their position, but you also have to use your instincts. Yeah, sure. Back when the AGs were suing tobacco companies, there was one guy who would spin you aggressively and would tell you things that would make you look dumb. When that happens, or when someone lies to you, you freeze them out. Do you ever have trouble getting someone to talk? You’d be surprised what people talk about. If you ask a question, people will usually help you out. I’ve always been shy, and I was nervous about talking to people in the beginning, but people like to share their knowledge. They do have a vested interest in getting publicity, too, but people also like to get their knowledge out. How do you balance getting a story out quickly vs. doing the best story possible? Everybody is a wire service now. The good thing is, you can always update. You can get the story out now and then add depth later. Who decides, you or your editors? Do you ever give experts quote approval? I always let them see the quote, but I’ll never let them change it or take it back. But it’s not an adversarial relationship. You don’t want to make them look bad. Sometimes they do try to edit the quote. What I’ll do is say, “OK, let’s talk about this a little more,” and I might get a better quote. I do sometimes run paraphrases by them if it’s not something I fully understand, but always by phone. And I never show them the story – just the quote. Do you get quotes by email? Yes, but it’s not going to be the freshest quote. It’s going to be labored. If I do use a quote I got by email, I will mention it in the story for the readers. I think it’s kind of dishonest not to tell them. Whether you’re a reporter, blogger, author or other content creator, ProfNet can help you with your search for expert sources. You can send a query to tens of thousands of experts and PR agents, search the more than 60,000 profiles on ProfNet Connect, or get timely experts and story ideas by email all for free! Need help getting started? Email us. Read this genius level article, ( The Game of Nerds Origins of Star Wars the Case for Maxfield Parrish ). The estate art studio and living quarters of Parrish were senselessly destroyed, it is gone with the exception of my rare film footage and documentary film evidence, plus I got artifacts and took photos, this is genius level, it is filled with major discoveries and theories.